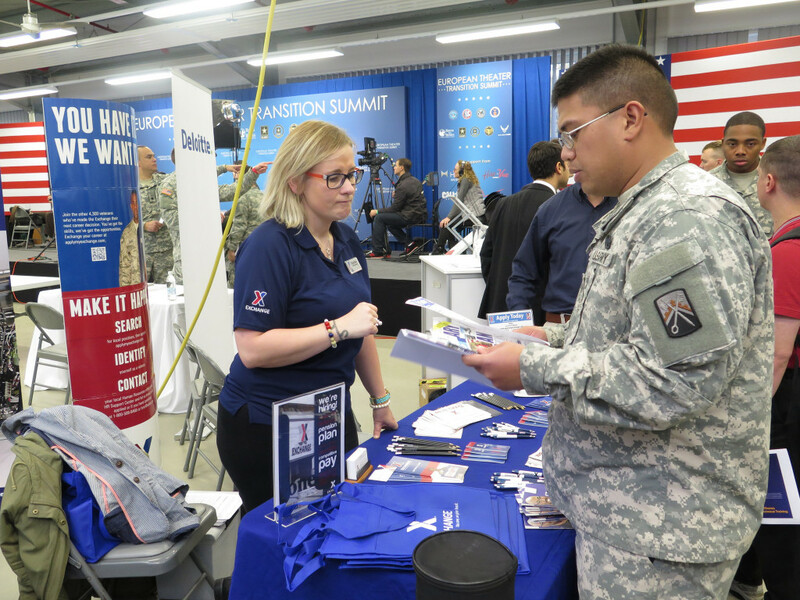 Transitioning Soldiers talk with employers and other career-related organizations during the first Transition Summit at U.S. Army Garrison Bavaria in November 2014. More than 35 organizations will be on-site at this year’s career fair March 8 at Bldg. 134 on Rose Barracks. GRAFENWOEHR, Germany—USAG Bavaria is hosting a Transition Summit March 7-8. Organized by the U.S. Chamber of Commerce’s Hiring Our Heroes Foundation and U.S. Army’s Soldier for Life initiative, the event is focused on helping transitioning service members, veterans and their spouses build skills and connections that will lead to meaningful employment. You should mark your calendars now, whether you’re transitioning in the next six months or in several years, said USAG Bavaria’s Transition Services Manager, Robert Reed. Here’s why. 1. The Transition Summit is bringing employment resources to our doorstep. There are a lot of advantages to being stationed in Germany—unique training opportunities, travel, travel associated with those unique training opportunities (Lithuania, anyone?). But some things can be harder from overseas, and transitioning from active duty to civilian life is one of them. The Transition Summit provides overseas transitioners a career fair experience similar to what stateside transitioners can access, Reed said. The two-day event brings together employers and representatives from organizations such as the Department of Veterans Affairs, Department of Labor, Small Business Administration and Chamber of Commerce. Currently, about 20 employers are signed up to be on-site during the career fair March 8, including Amazon, Hilton Worldwide, J.B. Hunt Transport, Lufthansa, COMCAST/NBC Universal and CACI International. Another two dozen employers will participate through a virtual employment web portal. 2. Hear employer perspectives on job hunting. Especially if you want those employers to hire you. The first day of the summit includes a town hall-style panel during which employers will talk about job hunting best practices and what they are looking for in applicants. Summit-goers will also be able to talk with employers during a networking event that same day, and during the workshops and career fair on day two. Employer feedback is invaluable, Reed said, especially if you are new to job hunting outside of the Army. “The first resume I created when I transitioned looked nothing like the later version that got me a job,” Reed said. 3. It’s not just for transitioning Soldiers. The primary audience for the summit is Soldiers who are separating or retiring in the next 12-18 months. However, the summit is also geared to leaders, veterans, and spouses, with panels and workshops focused for each group. Reed encourages spouses to attend along with their Soldiers. In fact, Reed encourages all Soldiers and spouses to stop by, even if their transition is several years in the future. To register for the Transition Summit, visit www.hiringourheroes.org. If you have questions about how to prepare for the event, contact the Soldier for Life: Transition Assistance Program at DSN 476-2055, CIV 09662-83-2055.